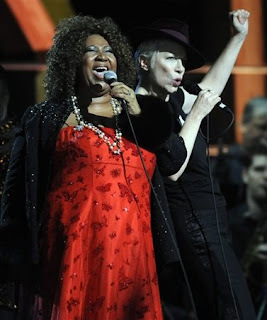 When Annie Lennox and Aretha Franklin joined forces, the result became an anthem for women’s lib that lit up the 80’s in the same manner that Helen Reddy did a decade earlier with her classic I Am Woman. Annie and Aretha made a powerful duo. Their unique voices, combined, were like a force of nature. When Eurhythmics was ruling with hits like Here Comes The Rain Again and Would I Lie To You, and Aretha was dominating the charts with Who’s Zoomin’ Who and Freeway of Love, the duet between these two phenomenal vocalists was a sure bet to take the pop front by storm. And this they did in a big way. Sisters Are Doin’ It For Themselves was a massive hit. It remains a radio fave to this day and women everywhere warmed to its message quickly. The video features both stars in rare form. Leading their hit like a hurricane they brought down the house. Few duets in history have been this impacting. A sheer delight, Sisters Are Doin’ It For Themselves just conquers all. Go ahead Aretha and Annie, go ahead!